← The long lost Forest Fingers (Caladenia sylvicola)? The number of visits one makes to the Saturday Salamanca market is inversely proportionate to the duration of time one spends in Tasmania. 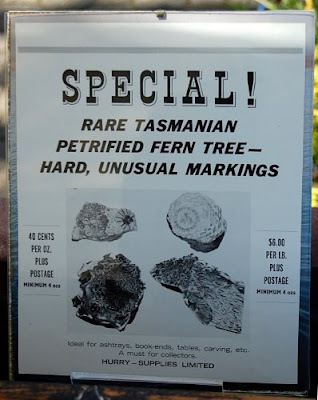 Yet, after five years in Tasmania I was delighted to stumble upon a store in the market run by Christo Lees, which showcases a fascinating caveat of Tasmania’s botanical heritage, something that I had failed to notice all this while. These petrified trunks, chalcedonic in nature, were found at Lune River down near the southernmost tip of Tasmania. The sections are believed to date to 165 million years back. There is a fabulous publication Occurences of gemstone minerals in Tasmania available online, which sheds some details on the fern flora at the Lune River location during the late Jurassic to early Cretaceous. 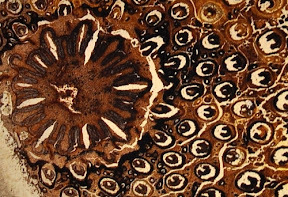 Fabulously preserved specimens were found there, showing beautifully and clearly the vascular details of the caudex (or trunk), and allowing paleobotanists (botanists who study fossils) to discern at least 11 species of arborescent (tree-like) ferns belonging to 3 genera. The largest of these genera is Osmundacaulis (Osmundaceae) of which 8 species have left petrified remains at the Lune River. 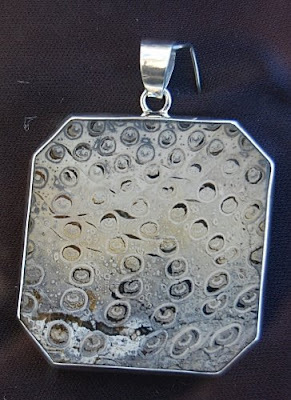 These fossils are world famous fossils among collectors and lapidiarists. They are often distinguished by the distinctive C-shaped vascular strands belonging to petioles (leaf stalks) that surround the central stem. Closeup of Osmundacaulis jonesii petrified trunk section. Vascular details showing the C-shaped vascular strands. Given this information, I suspect that the sections in Christo Lees store are from Osmundacaulis. A famous fern of this family is the Royal fern (Osmunda regalis) from Europe, America and Asia. 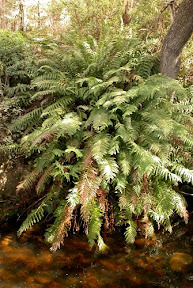 However the true closest modern day living relative of Osmundacaulis in Tasmania with a comparable stature would be the Southern Kingfern (Todea barbata). Todea barbata, while not exactly a tree fern, has a thick trunk and can become treefern-like. A true ‘King’ in stuture! I have had the pleasure of seeing a robust and healthy population of some rather large Kingferns at the base of the Blue Tiers. I imagine that if civilization still exist and still indulges in the study of paleobotany in 165002009 AD, they might find Kingfern fossils in what they might call the Blue Tiers fossicking site. For now however, it is a pleasure to know that ‘imperialism’ in ferns live on in the form of Todea, and that their ancestry is beautifully captured in the jewellery of Christo Lees. This entry was posted in Ferns, Fossils and tagged chalcedony, chalcedony fossils, Dicksonia, Ferns, fossil plants, Lune River, manfern, Osmundacaulis, Osmundaceae, paleobotany, petrified wood, Salamanca, Salamanca market, Southern Kingfern, Tasmanian fossil history, Todea, Todea barbata, tree ferns. Bookmark the permalink.